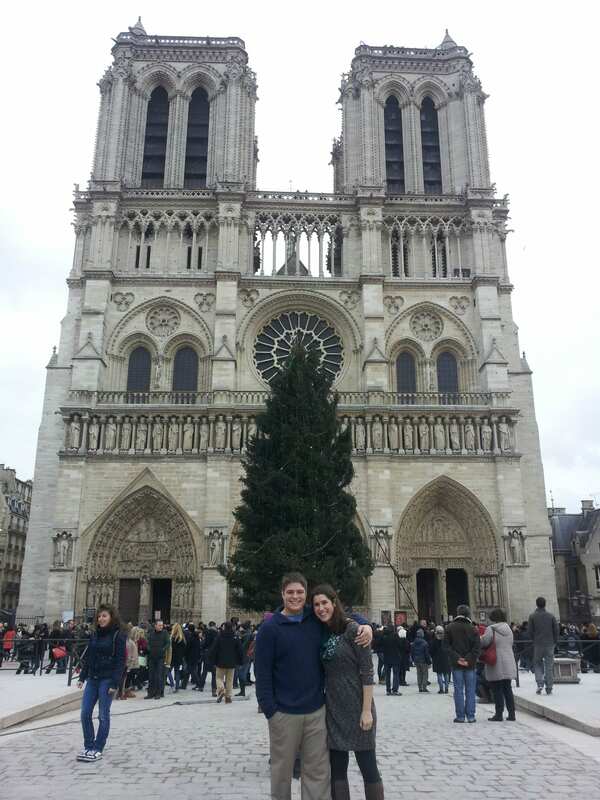 How could we pass up seeing Notre Dame with a giant Christmas tree, right? This is a blog about beauty, exploration, passion, adventure and desire. Fierce, consuming desire–desire that leaves you begging for more the second that you reach your goal, leaves you perpetually thirsty for another taste of your chosen obsession. This is what traveling is for me. If there is one conversation I will never forget, it is the moment I sat on my mom’s kitchen counter, passionately convincing my brand-spanking-new husband that we absolutely had to visit somewhere–anywhere–in Europe for New Year’s. You see, if we didn’t, the time might pass, the iron wouldn’t be hot, and we may not go before we have kids. We’d get bogged down in jobs. Life would get complicated. We had to go, now. Basically, I was selling this trip with all the fervor of a political candidate who is behind in the polls. 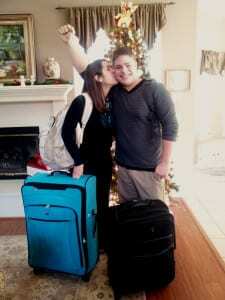 (And really, it didn’t take that much to convince Jeremy–he was thrilled to go, if a little more hesitant to financially commit). I should have recognized the signs, then. Less than a year before this conversation, we had been picking up our passports for our very first international trip–our honeymoon to the Bahamas, which we had enjoyed just a few short months ago. It was a big deal, and I thought it would quench the thirst for exploring the globe that had been gnawing away at me. This was basically my expression at least 50% of the time during this trip. Later that day, we decided on (and booked nonrefundable plane tickets for) Paris: 8 days, 7 nights. A little long for one European capital by many people’s standards, but it was our first trip across the pond, we were a tad nervous, and yes, okay, a little cowardly. As luck would have it–Paris was worth all that time, and more. Three months after booking the tickets, we were on our way. Clearing the Atlantic was an oddly exhilarating experience–our first time on an enormous jetliner, and by far the best airplane food I’ve ever had. By the time we landed, however, I was exhausted. Cranky. Confused. Desperately trying to remember my high school French while navigating a gigantic international airport and attempting to figure out how to use public transportation for the first time in my life. The train was hot, and crowded. I didn’t know where I was going, and I was completely convinced we were going to get turned around. We sped from Charles de Gaulle through some very non-Instragram-worthy parts of Paris, far from anything you’d see on a postcard and covered in graffiti and trash to boot. Really, though, what were we thinking with that luggage? We could have lived for months out of those. Finally, after a couple of line changes and the occasional panicked moment of thinking we were lost, the train pulled into our stop. We climbed the stairs, dragging our suitcases behind us up to street level. And then–it hit me. The cathedral to our left, chiming out bells. The flower shop straight ahead, full of fresh flowers. The New Year’s Eve breeze cooling my face. The stunning buildings, the soft babble of French, the cobblestones. At that moment, I was exactly where I wanted to be. And it didn’t matter that I was dragging my suitcase awkwardly over cobblestones, or that I wasn’t quite sure where the hotel was (or which Paris neighborhood our accommodation was in) or that I wanted to do nothing more than sleep for the next 6 hours (which definitely happened). It didn’t matter, because right then, I was consumed with a simple fact that would completely alter the direction of my life: this wasn’t anywhere close to being my last trip. I would get better at this whole traveling thing, because this city, this week, this beautiful place–this was not an accomplishment of any kind. Paris was one small water droplet in an ocean-sized crater of desire, and I would never, ever be able to fill it.